The Irish Gift House has clothing galore to complete your St. Patrick's Day costume. These St. Patrick's Day costume accessories will have you covered from the top of your head to the tip of your toes. Get the St. Patrick's Day party started and show up in glorious splendor with your St. Patrick's Day clothing. Some of our Irish costume accessories include fun Irish party hats and caps along with ties and vests. Additionally we have scarves and bandanas for your neck and slippers and socks for your feet. For your hair we have Irish wigs and shamrock hair bows; we even have a light up shamrock tiara. 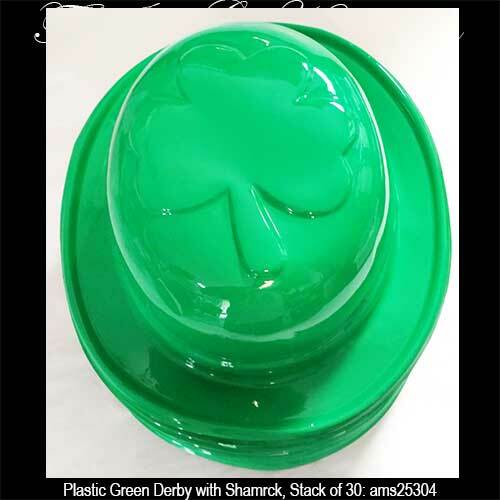 These plastic green derbies are enhanced with a molded shamrock on top and they will be the perfect accent for your St. Patrick's Day costume. This long Irish scarf features green shamrocks galore! These Irish slippers are loaded with embroidered shamrocks. You can be the world's tallest leprechaun on St. Patrick's Day when you wear this Irish top hat with a light up shamrock. This St. Patrick's Day costume is features a green shamrock vest and a matching bow tie. 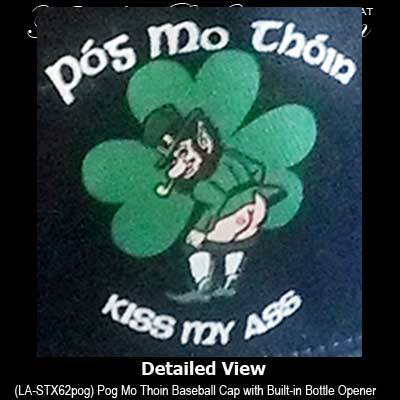 The Póg Mo Thóin Irish cap features a built-in bottle opener on the brim and it is enhanced with a leprechaun and shamrock. Wear this embroidered Irish cap when your are drinking as it features a built-in bottle opener on the brim. This double sided Irish scarf features shamrocks on both sides. This jester style Irish hat for St. Patrick's Day features dangling shamrocks and a green and white color scheme. This green plaid Irish Gatsby hat features a snap brim. The repeated design on this Irish scarf with shamrocks and Celtic knots is Kiss Me I'm Irish. This bob style Irish wig features short lime green hair that is a perfect accompaniment for your St. Patrick's Day costume. This leprechaun hat features shamrocks in a green on green design. This Irish cap features a built-in drinking meter. This green afro wig is sure to get the St. Patrick's Day party started and you are certain to get noticed at the parade, pub or Irish party. This St. Patrick's Day hat is small enough that it might just fit a leprechaun, but a human will need the plastic head band to hold it in place. The Irish Gift House also has an extensive assortment of more subdued clothing designs that may also help accessorize your attire on St. Patrick's Day that include Irish t-shirts and Irish sweatshirts. For your head we have traditional Irish flat caps that are woven from wool and baseball style shamrock caps too. Naturally we have an assortment of Irish rugby shirts and Irish polo shirts that would be perfect for casual wear or a round of golf. Please also look at our selection of children's Irish t-shirts where we have smaller sized humorous and shamrock designs that are great for St. Patrick's Day and also for picture day. For our even smaller sized garments for baby and toddler we will direct you to our Irish baby clothing where we have assortments of dresses, onesies and t-shirts.